The road is a series of hairpin turns that snake up and down the steep mountains and though the narrow valleys of northern Vietnam's Ha Giang province. Rice paddies flanked by towering cypress pines or tangles of bamboo cascade down precipitous slopes. Layer upon layer of triangular karst peaks burst upwards from the plateau, cradling small farming villages in their shadows. In February, fields of bright yellow mustard greens display a pop of fresh color. The air is cool and dry, carrying the scent of plowed mud and the occasional whiff of oxen. The metallic clang of cattle bells broadcasts across the valley. But your ears will be listening for the familiar triple-honk of an oncoming bus or the high-pitched toot of a scooter announcing its presence around the next blind turn. Your eyes will be scanning the next switchback for an overweight truck that will require you to pull off for passage. Your muscles will be flexed in preparation for the next unexpected dip in the road. All senses on heightened alert is one part of the exhilaration on this extraordinary motorbike tour through the Dong Van UNESCO Karst Plateau Global Geopark. A window into the lifestyle of northern Vietnam's 17 ethnic minority cultures will also have your heart racing. Weather-aged, muscular women in brightly-patterned skirts of verdant green, blazing orange, and deep crimson clear rocky fields with short curved machetes, filling their daughters' straw baskets with sugar cane. Their husbands man-handle wooden plows muscled through compacted dirt by stubborn ox; sons clear debris and heavy stones. At the market, the ladies from the Hmong, Tay, Lo Lo and other cultures come dressed to impress in their ethnic best, ready to trade fabrics, livestock, and household goods... and maybe catch the eye of a cute guy from another village. Trekking through the countryside, children shout "HELLOOOO!!" from impossible distances and run to high-five and wave at foreigners. Engage with them and you'll see that their English skills are better than expected! 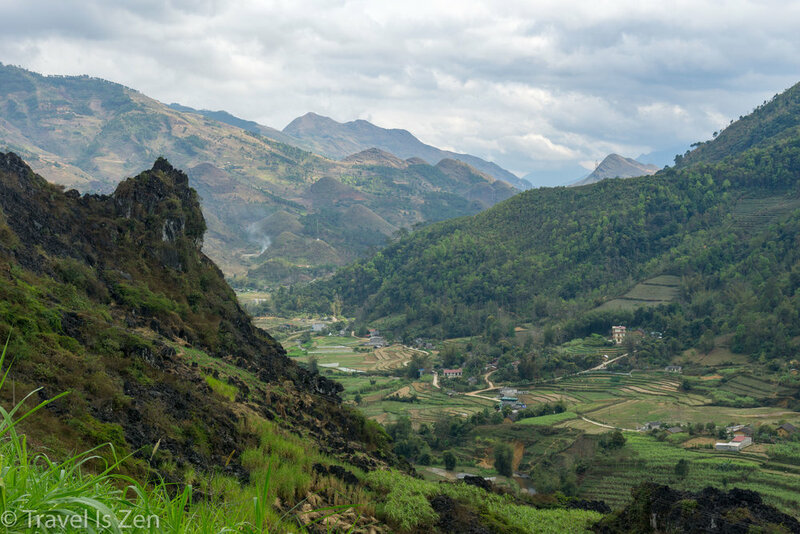 The Ha Giang loop currently flies under the radar of most tourist guides, yet is developed enough to accommodate a range of traveler budgets, from cheap local homestays to quiet, comfortable hotels; from roadside grilled snacks to upscale bars and restaurants in the main towns. The loop we did was 350 kilometers, starting from Ha Giang, where we rented our motorbike from QT Motorbike Rental and Tours. The owner of Song Lo hotel in Ha Giang held our big packs for a few days; we downsized to just daypacks for the trip. We spent two nights in Du Gia at Du Gia Homestay, two nights at Lam Tung hotel in Dong Van, and another night at Ha Anh homestay in Yen Minh. We took our time, taking two days to just hike around Du Gia and Dong Van. 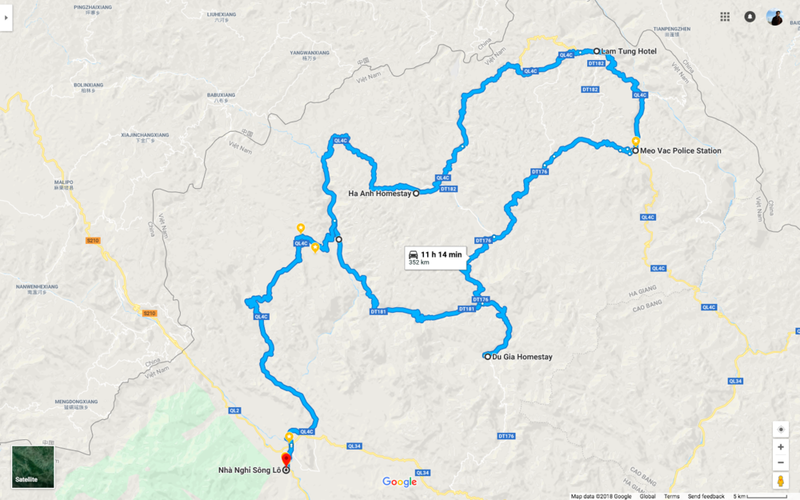 The highlight of this loop was "Happiness Road" through Ma Pi Leng pass between Meo Vac and Dong Van. The blue-green waters of the Nho Quế River wind through the valley of mountains nearly a mile high. 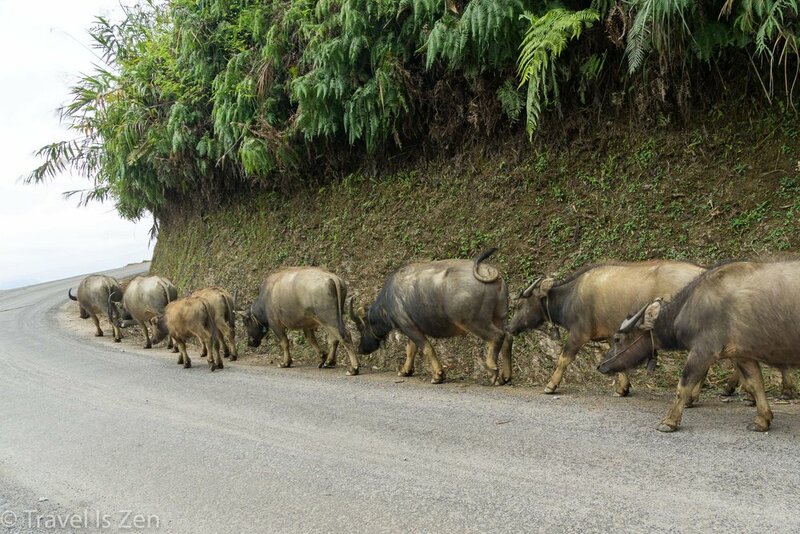 CAUTION: For all their scenic beauty, the roads throughout the Ha Giang motorbike circuit are unpredictable. They are paved for the most part, but pock-marked with severe potholes. Turn a bend and the pavement could be gone, leaving only rock scrabble. Pay the extra few dollars for bike insurance and safety gear rental. I will tell you our story to highlight the point: we came around a benign bend in the road and applied the brakes too hard in an attempt to avoid a sudden fracture in the pavement. The front wheel locked up, the bike tipped, and we slid a couple of feet across dirt and pebbles. We were lucky to walk away with ripped jackets and one battered knee (Caffrey). On the upside, we met some incredibly wonderful people who came to our aid: the two women who helped us move the bike out of the road, the man who called the pharmacist in Meo Vac, the pharmacist who opened his doors after hours to triage Caffrey's wounded knee so that we could get to Dong Van, the hotel owner who assessed our dusty, frazzled condition when we checked into Lam Tung hotel and immediately called for a nurse. Finally, the kind-hearted, lovely former-Nurse Diu Nguyen!! This beautiful heart took care of Caffrey's knee -- expertly cleaning the wound and applying bandages -- four times in the two days we stayed there and never asked for a dime! 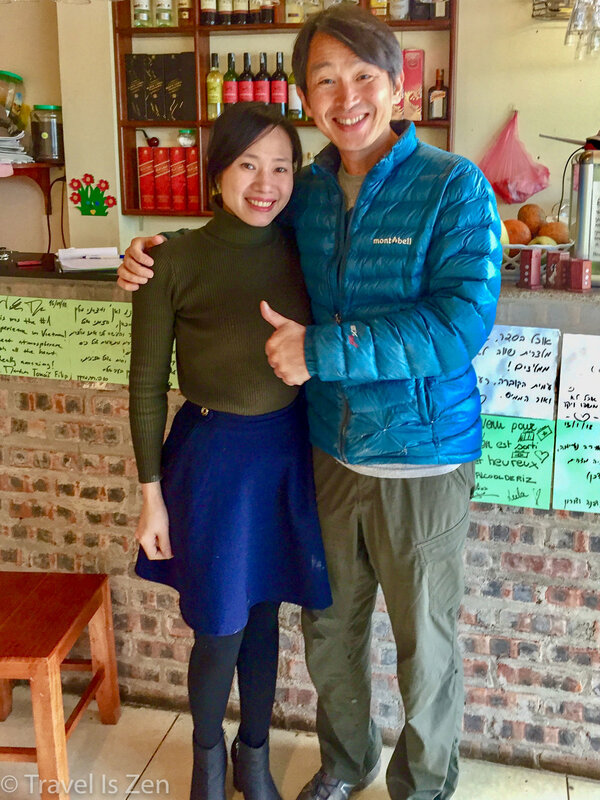 She is the owner of Green Karst restaurant, which serves a fine Chilean cabernet sauvignon and an excellent mushroom and veggie hot pot. And their breakfast pancakes are honest-to-goodness, down-home American-style fluffy pancakes (usually you get crepes when you order "pancakes" in Vietnam)! Despite our minor accident, our motorbike tour through Vietnam's northern highlands was the capstone of our two months in Vietnam. We met loads of interesting people and were immersed for days in truly awe-inspiring scenery. It was an unforgettable experience and we will be back in the future!